Playing golf in the rain will require various amount of waterproof clothing with rain pants being one of the most important. Staying dry will reduce uncomfortable chaffing and general discomfort. The best waterproof trousers for golf are the Zero Restriction Featherweight Pant Rain Pants. They use 100% polyester with the Gore Tex membrane for breathable waterproof protection that is durable yet comfortable. High-quality waterproof pants are also windproof for those windy days that bring a chill with the wind whilst playing golf. It’s very tempting just to get a pair of cheap waterproof pants for the wet season but for a little extra you can get much better. 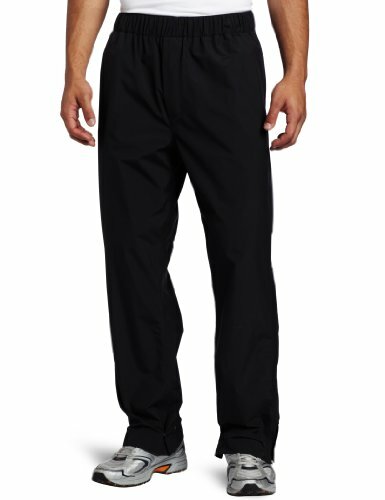 Golf rain pants provide more flexibility for your golf swing and are usually much more comfortable. You can wear the best waterproof jacket for golf but your bottom half will always become wet. 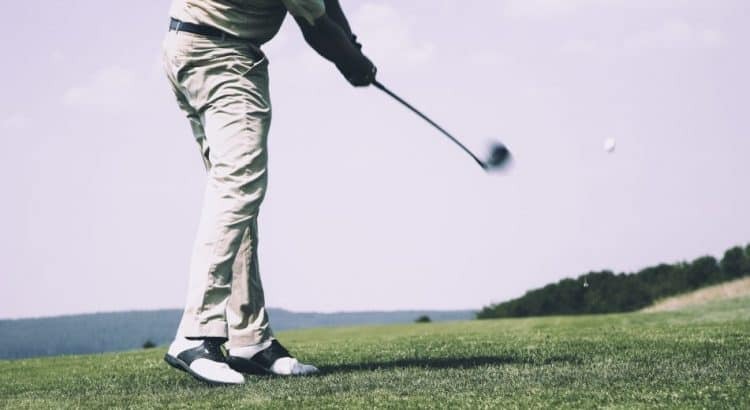 The discomfort will also end up taking its toll upon your golf performance. Purchasing some waterproof trousers for those days where you are craving to play in the wet will be worthwhile. There are many rain pants online but they are not all necessarily for golf. Below is a list of the best waterproof pants for golf where some are cheap and others are for those with a fairly high budget. The Zero Restriction rain pants are not for those people on a budget but for those looking for the best waterproof pants for golf that money can buy. They are the best because they include the Gore Tex fabric that provides excellent comfort yet fully waterproof with breathable features. The lightweight golf waterproof pants include leg zippers with rain gutters for easy on/off over golf shoes. To further reduce the chance of water getting in, there are also “ankle huggers” which snap on to your shoes. 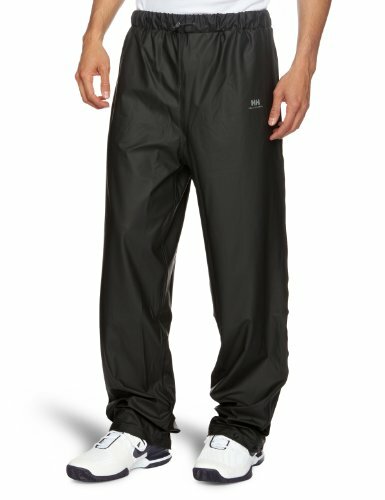 The Zero Restriction rain pants are great for wearing over another pair of pants that you are wearing. They provide excellent protection against rain and water in order to stay warm and dry during the winter season. They are the best waterproof trousers you can buy but not if you are on a budget. If you are looking for cheaper alternatives, the below pants are much more suitable. Helly Hansen is a premium waterproof clothing company worldwide with their reputable high-quality clothes. The Voss waterproof trousers are ideal for golf and made from 76% polyester and 24% PU material that is great as over pants. There are 9 sizes of these waterproof pants to choose from for every golfer. They offer great value for money for those who rarely play golf in the rain but want the best for when they do. Overall, the Helly Hansen Voss is the best golf waterproof trousers for the money and are very popular worldwide for that reason. 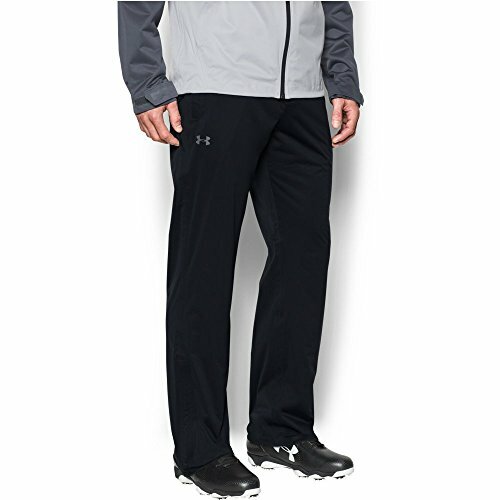 Under Armour is a premium clothing brand throughout the sporting categories from golf to rugby. Their Storm Rain Pants are fully waterproof with taped seems to provide the best protection from the rain and so that you remain completely dry. It hard to find waterproof clothing that is also breathable. However, the advanced UA technology is proven to do both, which is repel water and allow maximum breathability. These waterproof pants also have two pockets on the sides and one rear pocket for storing golf tees, mobile phones and other belongings. To increase comfort, the side adjusters are elastic for secure yet flexible fit. This also means they are fairly easy to fit over your trousers if you are wearing a double layer. Overall, these are the best golf waterproof pants for heavy rain or sleet. They are reasonably priced compared to the Zero Restriction models and are designed by the trendy Under Armour. The Adidas waterproof trousers for golf are made from 100% polyester and are seam sealed with one year’s warranty. They are waterproof to 3000 meters and are very lightweight to the point that they can be packed into the left pocket and stored in your golf bag for emergency use. Adidas have worked hard to ensure that these waterproof pants are lightweight and thinner compared to their competitors. For these reasons, they are the best rain over pants and very cheap considering the big brand. The main reason you will want a pair of rain pants for golf is to remain dry but be able to play to your best. The majority of golfers will wear their waterproof golf trousers over the top of another pair of trousers. For this reason, many rain pants do not include pockets that put many people off as they do not realize you wear them over the top. The best golf waterproof pants include breathable yet waterproof material for ultimate protection and breathability. We highly rate the Zero Restriction rain pants because they contain the premium Gore Tex material known for both waterproofing and breathability. Without these qualities, the other alternatives may be the better trousers. If you have ever got really wet whilst playing golf on the course, you will understand the pain. Buying waterproof pants for golf will seriously improve your performance and comfort out on the course during the winter and wet season. The PROQUIP Aquastorm PRO are lightweight rain pants with waterproof zips at the front and a Velcro pocket at the rear. This is very important if you are looking to keep a belonging secure and waterproof at the same time. With the PROQUIP Aquastorm, there is a three-year waterproof guarantee, which is a very long period but this means they are very confident with their rain pants. If a zipped waterproof pocket is something that you are after, these waterproof pants would be the best buy. They are reasonably priced and highly rated for what they are and can be easily worn over the top of your current trousers for waterproof protection.